Transiting Pluto opposite anyone’s natal Sun is an arresting phenomenon, confronting the person’s very identity and legitimacy on deep levels. There are no political or geographical boundaries to Pluto’s realm, just as with Plutonian elements such as radioactivity. Expand the implications to cover the first-ever Pluto opposition to the USA Sun. Pluto’s orbit is 248.4 years, and the Sun in the chart of a nation-state is the President, or Head of State; also the presidency. When one of the outer planets, Uranus, Neptune and Pluto, is within a few degrees of a key point in a chart, that gets my attention – even if these planets are not considered an integral part of classical Vedic astrology. They also do not rule over zodiacal signs or nakshatras. But currently, transiting Pluto is within a 3 degree orb opposite the USA Sun (Kelleher chart) at 22:38 Gemini, using the sidereal zodiac/Lahiri ayanamsha. This occurred for much of 2015 and 2016 and runs all through 2017 up to Jan. 2018, coming also later in 2018: August to November (i.e. continuing within 3 degrees opposite the USA Sun). Previously, this transit covered the last two years of the Obama presidency and the entire period of the controversial 2016 U.S. Presidential primaries and election. We will focus here primarily on what this means for tr. Pluto opposite the USA Sun in 2017, with Donald J. Trump in the presidency as of Jan. 20, 2017. Additionally, we take a brief look at the years when tr. Pluto was in Virgo in the USA 10th house (the presidency), and when tr. Pluto was in Scorpio in the USA 12th house on Sept. 11, 2001. While we know that the U.S. President is represented by the Sun and the 10th house in the national chart, it is not always clear what or who Pluto represents. That is because Pluto refers to subterranean forces, often criminal, that do not want to be seen or identified while they do their work. Pluto correlates astrologically to radical changes and transformations that are often forced on us, much like in the myth of Pluto (also the Greek Hades) – who wanted the young Persephone, and in order to have her, he kidnapped her and brought her down to his kingdom in the underworld. But Persephone was the daughter of Demeter, goddess of the earth and the harvest. In mourning for her only child, she causes all the plants to wither and die. When Persephone is allowed to return to earth for half the year, the plants flourish once again. She then returns to Pluto in the underworld and the same thing happens all over again, year in and year out. Professor Peter Dale Scott (University of California, Berkeley) has researched the topic for over 40 years and written about it in his many books. He expands the reach of the Deep State to include not only the intelligence agencies but organized crime working together with individuals, groups, and corporations holding extreme wealth. Deep State actors work both inside and outside of government. He describes it as not so much a structure as a constantly changing system or process, and very different now from what it was in the 1960s. Within all this the CIA plays a major role, with their secret power not controllable in large part because their budget is large and secret and never exclusively voted on by U.S. Congress. This leads to the Deep State being in effect at a higher level than the Public State, though a lot of what occurs in the Deep State is undocumented. The CIA was formally established by President Harry Truman when on July 26, 1947 he signed the National Security Act of 1947. On that day tr. Pluto was at 19:32 Cancer, in the 8th house of the USA chart conjunct natal Rahu at 16:51 Cancer and Mercury at 3:26 Cancer. This describes the large amounts of money that would go into military intelligence from then onward as well as the secretive aspect to the funding itself, which has no Congressional oversight. In the early 1970s Truman told his biographer, Merle Miller: “I think [the creation of the CIA] was a mistake. And if I’d known what was going to happen, I never would have done it.” (Plain Speaking: An Oral Biography of Harry S. Truman, 1973, p. 285) He refers to the kind of wide-ranging, unaccountable powers the CIA had developed from the time the agency was first established by Truman in 1947. His original aim was to reorganize the military establishment and centralize its many disperse intelligence agencies, though half of its purpose involved covert operations. Seventy years later, with so many technological advances, including the Internet and the World Wide Web, plus investigative powers extended by the USA Patriot Act (2001) and funding extended by Pres. Obama, Truman would not recognize today’s CIA. Even author George Orwell, author of 1984 (1949), would be astonished at the unprecedented and vast powers of the new Surveillance State, and how “Big Brother,” “newspeak,” and “doublethink” have all arrived. Having established that the Deep State correlates closely to Plutonian realities, ones that can be as offensive as they are elusive, we will next discuss how and where Pluto operates in astrological terms. The arena of life where Pluto forces change is determined by the house and sign position it is transiting. Pluto is currently in sidereal Sagittarius and moves through this sign for 15 ½ years: Feb. 8, 2005 to Feb. 25, 2020; June 30 to Dec. 30, 2020. Sagittarius is a warrior sign, and the one zodiacal sign symbolized by a weapon: an arrow, additionally, an archer with a bow and arrow. Any planet transiting through Sagittarius takes on this warrior thrust. In Vedic astrology the fire signs – Aries, Leo, and Sagittarius – are called Kshatryias, Sanskrit for the warriors and political leaders in Hindu/Vedic culture, who also had royal status. Thus, all the fire signs have royal associations, though these long-term ties can finally be broken if royalty is experienced as tyrannical. Sagittarius is ruled by the Dharmic planet Jupiter, who can provide an even stronger warrior instinct with the justifications Jupiter gives for religious and/or royal obligations, fueled by a sense of righteousness to fight the enemy. Sagittarius is the strongest zodiacal sign for patriotism, national pride, and nationalism, and thus an excellent Ascendant for a national chart. With tr. Pluto in Sagittarius closely opposite the USA Sun, we note how President Trump has expanded the military budget to an unprecedented $54 billion increase and appointed more generals to his cabinet than any president since World War II. Not even three months into his presidency, on April 7 and 14, 2017, Trump bombed targets in both Syria and Afghanistan and took stronger positions in confronting Russia, North Korea and China, among others. The Gemini-Sagittarius axis can be seen as the nervous system of the world. The USA has taken the lead in commanding the focus of much of the world’s media and trade, especially post World War II. The USA chart has not only Sagittarius Ascendant, but four planets in Gemini: Mars, Venus, Jupiter, and Sun. Mercury, planet of communications, rules over both Gemini and Virgo, and the USA natal Jupiter is in Gemini, while Jupiter transits through Virgo: Aug. 12, 2016 to Sept. 13, 2017. This Jupiter transit supports the President and offsets other more adverse trends, as will tr. Jupiter in Libra, which aspects the USA Sun in Gemini. How does Saturn’s weight crush Jupiterian concerns during the EARTH period? This happens due to the nature of both Jupiter and Saturn through the signs and elements, and also because the JU-SA combination is both a conjunction and a Graha Yuddha, or Planetary War, in which Saturn wins over Jupiter, who is far weaker in earth signs compared to Saturn. In a Graha Yuddha, the winning planet takes on the energy of the losing planet, while overpowering it with its own energy and agenda. Unless other factors soften the outcome, the affairs of the loser, as Karaka (significator) and house lord are diminished considerably. Intensifying this trend, Pluto’s transit through Sagittarius and on the Gemini-Sagittarius axis has special relevance to the use of media as propaganda, or information forced on us without our knowledge for manipulative purposes. And this is by no means confined to authoritarian countries. The CIA’s close ties with the media are now all the more facilitated by the consolidation of the media into only six major corporations owning 90% of the media, rather than 100s of media organizations, as was the case back in the 1950s. This was rapidly reduced from the early 1980s onward, with Reagan’s policies favoring corporate consolidation. During the era of Pluto in Scorpio and Sagittarius this capacity “to manipulate, censor and even fabricate stories” has exploded via new technologies enabling the mass manipulation and surveillance of data and the stealing of documents. This includes documents swept up by America’s intelligence agencies working closely with those in the UK and elsewhere. Though denied by intelligence officials in Congressional testimony, this massive data collection from all citizens everywhere was subsequently revealed through whistleblowers such as Edward Snowden (2013), Chelsea Manning (2010) and others via Wikileaks, with potentially radical consequences and changes in the public’s awareness of the Surveillance State. Wikileaks has played a pivotal role in this process of unmasking government secrets, and their track record for document authenticity is also excellent. Their domain name was first registered Oct. 4, 2006, and first documents published Dec. 2006. And yes, there was theft of documents by those risking their lives to do so. It could also be said they are filling a vacuum left by the dearth of investigative journalists, most of them now working for the corporate media, who in turn have strong ties to the CIA. Reflecting the dual nature of Sagittarius, the document leakers are seen by the government as traitors guilty of high treason, and by others as cultural heroes of high courage. As a reminder, Pluto remains in sidereal Sagittarius for 15 ½ years: Feb. 8, 2005 to Feb. 25, 2020; June 30 to Dec. 30, 2020. This covers four U.S. Presidential primary and election seasons: 2008, 2012, 2016 and 2020. Following the 2016 election, U.S. intelligence agencies announced they want to take control of U.S. elections as “critical infrastructure.” This may happen in 2020 or before, and if so – is a dangerous indication for any democracy. Meanwhile, the U.S. government’s defense of mass surveillance is perennially “national security,” claiming that one has to give up a certain degree of privacy to have security, and that they are only targeting foreign enemies. But the reality is that such surveillance targets all private citizens everywhere, including American citizens. It makes everyone more vulnerable to both domestic and foreign hackers. Trump has had ongoing battles with the U.S. liberal corporate media and also with U.S. intelligence agencies up through late March 2017, when a few key personnel changes forced on his administration appear to be related to his 180 degree turn from his previous policies and campaign promises, as discussed earlier. This may indicate the Deep State is gaining power over the President, and coincides closely with the Pluto Stationary Retrograde at 25:18 Sagittarius (2°40’ orb to USA Sun) on April 20, 2017, and includes his military actions taken April 7 and 14, 2017 in Syria and Afghanistan, respectively. Pluto’s connection to immense wealth has been established, also to covert actions which equate with being beyond accountability. Moneys that are untraceable or obscured in some way are very Plutonian, and since fiscal 1998 we note that $11.5 trillion is missing from the U.S. federal budget. (Source: Catherine Austin Fitts, investment banker & advisor, April 2017) From fiscal 2001 to 2016 the Pentagon received over $8.5 trillion in Congressional appropriations, by far the largest portion of the federal budget. (Source: The Watson Institute at Brown University) But as of summer 2016 the Pentagon was reported to be missing $6.5 trillion. Meanwhile, the budget for the CIA and some other intelligence agencies remains unknown, though we do know it is increasing exponentially, given the vast outlay for new intelligence projects, buildings and personnel. Other important Deep State flashpoints occurred during the Nixon and Reagan administrations, including shadowy events preceding both the 1968 and 1980 elections: Nixon’s alleged efforts to scuttle the Vietnam peace talks in Oct. 1968 (they stalled mysteriously just days before the 1968 election); and Reagan’s alleged interference with President Carter’s year-long efforts to free American hostages in Iran (they were freed minutes after Reagan’s Inaugural address). Reagan also survived an assassination attempt March 30, 1981. Nixon was elected in Nov. 1968 and 1972; Reagan in 1980 and 1984. During the Presidential elections of 1968, 1972 and 1980, tr. Pluto was in sidereal Virgo in the 10th house of the USA chart. The 10th house in a national chart is closely associated with the nation’s leader and the presidency itself. Pluto transited sidereal Virgo Oct. 6, 1968 to March 29, 1969; Aug. 5, 1969 to Dec. 6, 1980; March 21 to Sept. 30, 1981. The astrological parallel is that the Deep State seemed to be working closely at that time with the Head of State, symbolized by the 10th house as well as the Sun, until it became a problem for the Deep State to be associated with the President. With such visibility at the top of the USA chart, especially with two Pluto Stations within one degree of the USA 10th house cusp (Jan. 1972 and June 1973) the normally covert and clandestine Pluto was caught – symbolized by the Watergate burglary that got bungled, revealing Nixon’s criminal actions during his presidency, forcing him to resign in Aug. 1974. One of the five burglars was a CIA officer (James McCord), as were others of those convicted of taking part in the planning of the conspiracy, burglary, and illegal wiretapping, including E. Howard Hunt, CIA and G. Gordon Liddy, FBI. All in all, there were 47 government officials jailed or indicted for Watergate crimes, including Attorney General John Mitchell. By Sept. 30, 1981 tr. Pluto had exited Virgo and the 10th house of the USA chart. Thus the Deep State was no longer in the spotlight, where it is more easily seen and caught. And while Congress, the judiciary and the media did check Nixon’s gross abuse of power in the early 1970s with tr. Pluto in Virgo, by the mid-1980s those same institutions ceased to protect the nation from serious abuses by the Chief Executive and CIA covert operations. Reagan’s Iran-Contra operations did not bring down his presidency, nor did his reported efforts to sabotage President Carter’s Iran hostage negotiations in 1980. The Reagan administration instructed at least one official we know of (Lt. Col. Oliver North, an NSC official at the Reagan White House) to sell weapons to Iran to fund anti-communist death squads in Nicaragua. This was against express orders by Congress. The earlier part of Iran-Contra had to do with selling weapons to Iran as part of a reported arrangement to free the American hostages in Iran and convince Iran they would get a better deal with Reagan than with Carter. Weapons and money flowed to Iran, and the hostages were released moments after Reagan’s Inaugural address in Jan. 1981. There is no question that Reagan benefited from Pluto’s exit from Virgo, except for six months in 1981 (March 21-Sept. 30). Moreover, his personal survival and his presidency were greatly protected by the triple JU-SA conjunctions in Virgo, two of them close to his election and inauguration. When tr. Pluto entered Sagittarius in Feb. 2005 (thru Dec. 30, 2020), the Deep State looks to be working largely against the Head of State, since Pluto in Sagittarius is now opposite the Sun and confronting it rather than working WITH the president, especially the closer tr. Pluto comes by degree to the exact opposition to the USA Sun at 22:38 Gemini. This may account for some of Obama’s 180 degree turns in his policies as well as recent ones by Trump. In an unprecedented development, this already large campaign alliance was supported privately by the CIA and publicly by ex-CIA officials. Mike Morell’s op-ed piece in The New York Times, Aug. 5, 2016 read: “I Ran the CIA. Now I’m Endorsing Hillary Clinton.” Morell actively campaigned for Clinton, calling Trump “unqualified and unsuitable,” mainly because of his supposed (but unproved) improper connections to Russia. Similarly, ex-CIA and NSA official Michael Hayden went to The Washington Post to criticize Trump and support Clinton. But together the Clinton-Neocon alliance continued opposing Trump even after the election, cheerfully urging on the CIA in their efforts to sabotage Trump in any way possible, apparently unaware of the dangerous and unaccountable powers they are unleashing. They favor a new Cold War with Russia, whereas Donald Trump did not – until April 2017. Up to March 31, 2017 Trump’s policy was that Syria could decide its own future without U.S. involvement. His sudden shift of position in early April 2017 changed all that, as we know, and within a few weeks of the Pluto Stationary Retrograde on April 20, 2017. Other surprising alliances became established as early as of Nov. 2016 with Trump’s election, and with the express purpose of destroying his presidency. One of them is comprised of four organizations who work together in secret, supported by Obama/Clinton forces paid $35 million annually, though now increased to $100 million annually: 1) Media Matters; 2) American Bridge 21st Century; 3) Citizens for Responsibility and Ethics in Washington — CREW; and 4) Shareblue. Their collective aim is to destroy the image and reputation of the Trump presidency. [ix] David Brock founded all four organizations and is closely associated with each of them. He was hired by the Hillary Clinton campaign to destroy Sanders and then Trump. Brock has worked as “political assassin” for both the Republicans and the Democrats. The parallel to Plutonian traits is clear: Their tactics know no boundaries and no ideologies in their aim to retain or acquire power, privilege and wealth. If the USA Sun were in the Ascendant and tr. Pluto in the 7th house, we could say the likelihood of the opposition to Trump comes from foreign powers. But as Pluto is transiting through House 1, this indicates that opposition to the Head of State has to be homegrown and already a part of the national apparatus in some way. The Left is working to lead a resistance movement against Trump, while corporate Democrats appear to be working actively to destroy and delegitimize his presidency. Will Trump withstand this onslaught? It appears from the strength of his birth chart that he could, but it is a very big and relentless battle, not easing up until tr. Saturn finishes its last passage through Scorpio, June 22 to Oct. 27, 2017. This Saturn will oppose Trump’s natal Sun-Rahu in the 10th house and conjunct his Moon-Ketu in the 4th house, repeating the pattern in place through late summer and fall 2016, exiting Scorpio on Jan. 27, 2017. The last Pluto station (within 3 degree orb opposite the USA Sun) is on Sept. 28, 2017. Within 07’ orb opposite the USA Sun, it is potentially even more intense than the one in April 2017. We cannot underestimate the power of this transit, though tr. Jupiter in Virgo provides some support and protection to Trump’s natal Sun-Rahu in his 10th house up to Sept. 13, 2017. Similarly, tr. Jupiter in Libra aspects the USA Sun (Sept. 13, 2017 to Oct. 12, 2018). Tr. Pluto remains in Sagittarius thru Dec. 2020. Using whole sign houses, tr. 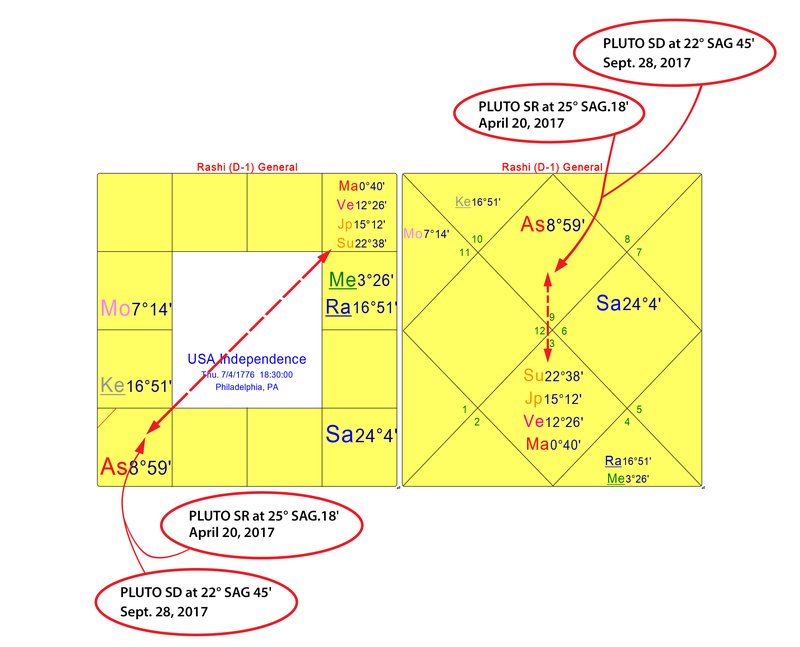 Pluto is in the Ascendant (House 1) of the USA chart, so in a way hiding in plain sight in its opposition to the USA Sun. The closer the opposition, the fiercer are the attacks on this presidency by forces that normally refuse to be identified or labeled. With two close Pluto stations in 2017 opposite the USA Sun, this intense confrontation brings events to a crisis point, with issues becoming obvious and demanding a solution. Even the very term “Deep State” has become more known during Pluto’s transit in Sagittarius, and hotly denied. One thing we do know by understanding Pluto’s reality: Plutonian forces will do anything to retain their power and wealth, especially when they see it could be threatened. The organization publishing key leaked documents is by no means rich. Wikileaks is a non-profit organization funded and operated by volunteers. Their source of funding has been forcibly cut off at times. Their stated purpose is to expose those with undue power and wealth, especially if their actions are perceived as immoral and illegal, indeed often amoral. Wikileaks’ sources are guaranteed anonymity, as they risk a lot by sharing their documents. If they are caught, they are severely punished under the 1917 U.S. Espionage Act, as with Chelsea Manning, whose 35-year prison sentence was commuted after 7 years. Since his initial arrest in Dec. 2010, Wikileaks’ founder Julian Assange has lived as a virtual political prisoner up to spring 2017, residing since June 2012 at the Ecuadorian Embassy, London, UK. He was granted asylum in Ecuador but not allowed to leave the UK. A Swedish case against him (Aug. 2010) with sexual allegations is largely seen as a veiled attempt to extradite him to the United States. In Feb. 2016 a United Nations panel decided Assange was being held illegally in “arbitrary detention,” but the U.N. is often ignored if its positions differ from the will of certain major nation-states. And while Ecuador’s election April 4, 2017 assured Assange could remain at their London embassy, U.S. Attorney General Jeff Sessions announced on April 20, 2017 (the day of the Pluto SR) that the U.S. was preparing charges to seek Assange’s arrest. On this day also, Trump lost a key media ally with the firing of Bill O’Reilly from Fox News. Saturn’s return to the same sign after 28 years is usually a time of reckoning. The true understanding of what was begun at the previous Saturn cycle in this sign becomes much clearer. In this case, it returns to the world axis of trade, travel and communications, where 28-30 years earlier, some major developments occurred with both trade and technology, and we are seeing their repercussions now. The World Wide Web was proposed March 4, 1989 and invented Dec. 25, 1990. Without this invention the communications/intelligence/surveillance network we know would not exist. Until Pluto leaves sidereal Sagittarius in Dec. 2020 we may not understand the full impact of today’s metadata sweeps. They propose to be secret and yet can act virtually as political assassins to discredit and defeat one’s competitors or enemies, and steal or disable their commercial products or infrastructure. The whole world becomes a Surveillance State. On Jan. 12, 2020, towards the end of its 2.7 year transit through sidereal Sagittarius, tr. Saturn conjoins Pluto at 28:38 Sagittarius. This is a potent point in the Vedic sidereal zodiac, being a Vargottama degree, i.e. repeating in the same sign in the Navamsha chart. The doubling of the Sagittarian effect through the Saturn-Pluto lens reflects the ruthlessness of Pluto combined with Saturn’s business efficiency and organizational skills. Though Jupiter-ruled Sagittarius is a military sign, it is also philosophical, with tr. Jupiter at 15:12 Sagittarius on Jan. 12, 2020. But that may not be enough to soften the militaristic trajectory we are on, where problems are more often addressed with weapons than with diplomacy. Wars provide huge profits for the military/industrial complex and BIG OIL – all those closely aligned with the Deep State. As Wikileaks has revealed, Syrian President Bashar al-Assad first became more troublesome in 2009 when he refused to allow an oil pipeline to run through Syria, from Qatar to Europe. In the same time frame, obstacles were removed in other areas of international trade. Tr. Pluto’s entry into Sagittarius in 2005 marked the realignment of global trading blocs, with a new and potent alliance between China and 15 post-Soviet states, including Russia – since 2005. Meanwhile, the USA is in the 18-year Vedic Rahu Dasha from Sept. 28, 2015 to Sept. 27, 2033. (Rahu is the North lunar node; Dasha is a planetary period.) The USA was born in a Rahu Dasha and in the midst of a revolution. So we are again in a time of revolution, and one bursting with technological inventions, but also fear-based actions, as there are many destabilizing influences and obsessions. Rahu is the foreigner, the outcast, and located with Mercury in the 8th house of the USA chart. It is no accident that the U.S. birthed Perception Management, along with the advertising and public relations industries. In the most recent Rahu Dasha 1895 to 1913, the U.S. received waves of immigrants, especially from Eastern Europe, a trend from 1880. The tide turned against such an influx with laws passed in 1921 and 1924. Given that Trump has promised to take a strong stand against immigrants and campaigned on that premise, we see once again the focus on Rahu as the foreigner or outcast at the start of the USA Rahu Dasha. In fact, Trump the candidate was a virtual outcast of the Republican Party establishment, even if he is a billionaire real estate mogul. He was still seen as the outsider, and his supporters rallied around him in huge numbers because they did not want an insider politician. So in many ways we see how the Plutonian opposition to Trump is undoubtedly coming from elements within the established power structure who do not want to see him change their status. We know from vote fraud experts that statistics were considerably skewed so that everyone believed Hillary Clinton was a virtual shoo-in. But the masters of media manipulation told us that the majority of voters were registered Democrats, when that was not true. Their numbers were far fewer than the Independents, who had voted for Bernie Sanders in droves, and then later went for Trump or Jill Stein. The excuse that Hillary won the popular vote is still used to delegitimize Trump, though it was not used on George W. Bush when Gore won the popular vote in 2000 but not the presidency. Rahu Dasha has already brought Americans a wild ride, and it runs through fall 2033. But tr. Pluto opposing the USA Sun this closely will not happen again for another 248.4 years. Its strongest push will be from April through November 2017 (with the Pluto stations April 20 and Sept. 28, 2017), and perhaps some further action in fall 2018 after a Pluto Stationary Direct at 24:39 Sagittarius. This makes for a very intense and tough ride for the U.S. president. Pluto can be coercive and subversive and rarely accountable for his actions, as we have seen many times in our Plutonian realities. The Deep State has potent allies in the media and elsewhere, including those who encourage and/or fund the undermining and destruction of a presidency and of a political enemy, much as Richard Nixon did in 1972. Some of Trump’s allies have already been forced out of his sphere of influence, the first and most immediate effect being to reverse his policy of a more peaceful approach to dealings with Russia. [i] http://johnpilger.com/articles/inside-the-invisible-government-war-propaganda-clinton-trump Oct. 27, 2016. [ii] https://www.youtube.com/watch?v=z0D9WroKjRw) Peter Dale Scott on Dark Journalist, April 6, 2017. [iii] The majority of United Nations members want to ban nuclear weapons, but the U.S. is adamantly opposed to such a ban, first proposed in a historic vote at the U.N. on Oct. 27, 2016, but not covered in the U.S. media. The U.S. pressured its allies to vote against the ban, but Japan has already said it will change its vote and join the negotiations to outlaw nuclear weapons. [v] http://www.zerohedge.com/news/2017-03-15/intelligence-sources-reveal-obama-used-british-agents-trump-wire-tap-surveillance Obama used Britain’s GCHQ to spy on then-candidate Trump. http://www.zerohedge.com/news/2017-03-06/top-nsa-whistleblower-intelligence-agencies-did-spy-trump William Binney: Executive Order 12333 allows the government to do unlimited spying, no matter what intelligence officials claim. [vii] https://www.youtube.com/watch?v=q92IsbG-O1w William Binney, NSA system developer. If the Russians hacked there would be evidence. https://www.youtube.com/watch?v=4RhziSn_lcE CIA veteran Ray McGovern of Veteran Intelligence Professionals for Sanity. [viii] https://richardcharnin.wordpress.com/ Richard Charnin is an applied mathematician who successfully predicted the U.S. Presidential elections of 2008, 2012, and 2016 to the exact number of electoral votes. See his March 15, 2017 post. Charnin’s figures show Trump won the popular vote by a minimum margin of 2.3 million and a maximum margin of 6.2 million. Voter registration statistics were skewed in mainstream news, with Democrats over-weighted and Independents under-weighted. [ix] http://www.europereloaded.com/clinton-system-discredit-donald-trump/ by Thierry Meyssan, March 3, 2017 : The Clinton system to discredit Donald Trump. Guttman, Arielle and Kenneth Johnson, Mythic Astrology: Archetypes in the Horoscope, 2016. First edition 1993: Mythic Astrology: Archetypal Powers in the Horoscope. Mayer, Jane, The Hidden History of the Billionaires Behind the Rise of the Radical Right, 2016. Scott, Peter Dale, American War Machine: Deep Politics, the CIA Global Drug Connection, and the Road to Afghanistan, 2010, 2014. Scott, Peter Dale, The American Deep State: Wall Street, Big Oil, and the Attack on U.S. Democracy, 2014. Scott, Peter Dale, The Road to 9/11: Wealth, Empire and the Future of America, by Peter Dale Scott, 2008. Scott, Peter Dale, The War Conspiracy: JFK, 9/11, and the Deep Politics of War, 2013. Valentine, Douglas, The CIA as Organized Crime: How Illegal Operations Corrupt America and the World, 2017.
http://www.breitbart.com/big-journalism/2017/03/15/virgil-deep-state-hiding-plain-sight-full-coverage/ The Deep State Hiding in Plain Sight with Full Coverage Excerpt: MSM [i.e. mainstream media] is doing everything it can to encourage, aid, and abet Deep State operations. https://www.consortiumnews.com/archive/story34.html by Robert Parry, Firewall: Inside the Iran-Contra Cover-up © 1997.
https://consortiumnews.com/2017/03/19/nyts-tinfoil-hat-conspiracy-theory/ by Robert Parry Excerpt: There is a “tinfoil-hat” quality to The New York Times’ pushing its “Donald Trump Is Russia’s Manchurian Candidate” conspiracy theory as the newspaper sinks deeper into a New McCarthyism. https://consortiumnews.com/2017/04/12/trump-finds-his-groove-with-warmaking/ Interview with Australian journalist and filmmaker John Pilger. http://www.darkjournalist.com/s-farrell9.php by Dr. Joseph Farrell, Deep State Disinformation : June 9, 2016.
http://www.europereloaded.com/clinton-system-discredit-donald-trump/ by Thierry Meyssan : The Clinton system to discredit Donald Trump, March 3, 2017.
http://www.globalresearch.ca/the-cia-and-the-media-50-facts-the-world-needs-to-know/5471956 by James Tracy, Dec. 01, 2016 : first published Aug. 2015 at Memoryholeblog.com. http://www.globalresearch.ca/hillary-clinton-approved-delivering-libyas-sarin-gas-to-syrian-rebels-seymour-hersh/5522647 by Seymour Hersh April 28, 2016.
http://goodtimesweb.org/covert-operations/2013/lrb-hersh-syria-sarin-dec-19-2013.html Seymour Hersh tracks how once again false intelligence almost led to a U.S. attack on Syria in 2013. First published in The London Review of Books, Dec. 19, 2013.
https://theintercept.com/2017/01/25/seymour-hersh-blasts-media-for-uncritically-promoting-russian-hacking-story/ Jeremy Scahill interviews Seymour Hersh. https://theintercept.com/2017/02/28/the-new-yorkers-big-cover-story-reveals-five-uncomfortable-truths-about-u-s-and-russia/ by Glenn Greenwald: Excerpt: Anonymous claims from agenda-driven, disinformation-dispensing intelligence community officials are about the least reliable way to form judgments about anything, let alone the nature of the threats posed by the governments they want Americans to view as their adversaries. http://www.tomdispatch.com/post/175629/ by Tom Engelhardt, The Visible Government : How the U.S. Intelligence Community Came Out of the Shadows, Dec. 16, 2012.
https://www.youtube.com/watch?v=g4jvDZFUWoc March 9, 2017 Roger Stone interviews CIA veteran John Kiriakou about the Rogue CIA. https://www.youtube.com/watch?v=ufVJ7J7j_h4 March 20, 2017 What Is The Deep State? James Corbett on Financial Survival. https://www.youtube.com/watch?v=z0D9WroKjRw April 6, 2017 Deep State Battle! Trump, CIA & Cold War II Dark Journalist & Peter Dale Scott. https://www.youtube.com/watch?v=3n82DjnniYw April 12, 2017 Act of War: Politicians Sell Russia Election Interference with NO Evidence. [5 min. of news clips]. Sane Progressive. https://www.youtube.com/watch?v=FrjXnvkKGMM April 21, 2017 Glenn Greenwald on Democracy Now! As U.S. Preps Arrest Warrant for Assange, Prosecuting WikiLeaks Threatens Press Freedom.